What you know about the ShapeShift Shoulder Holster is that it has a lot of adjustability built into it. You can set it to carry exactly how you want it to...but boy, does it seem to have a lot of parts that can be adjusted. It's a natural thing to wonder, but bear in mind that we designed this shoulder holster so you could get a custom fit without having to have it tailored. That way, you can get a more comfortable carry, can carry in the fashion that you wish to, and therefore will be more likely to actually use your shoulder holster. How do you do that? Let's dive in! Our shoulder holster is easily adjusted for cant angle. If you turn the holster base over, you'll notice multiple locking ports for the straps. You simply change the position where the straps lock into the holster base to change the cant angle. If you have a bit of trouble, push on the strap lock from the other side of the holster base. That'll usually help it pop out. After you've moved the shoulder straps, move the belt hook to match and you've done it! You'll also want to know how to adjust strap length on the leather shoulder holster straps. This is how you adjust the fit of your ShapeShift shoulder holster. The proper fit is important with any shoulder holster, as a good fit ensures a comfortable carry. You can also ensure easier concealment as a shoulder holster should be somewhat tight to the body. You don't want it to be uncomfortable, but you want to prevent the pistol from flopping around too much while you move with it. When you look at the straps, you'll notice the length is determined by the strap adjusters and by fasteners. At first glance, they may seem complicated but the philosophy of use is rather simple. The fasteners set the overall length, but the strap adjusters give you some room to adjust up or down as you see fit. 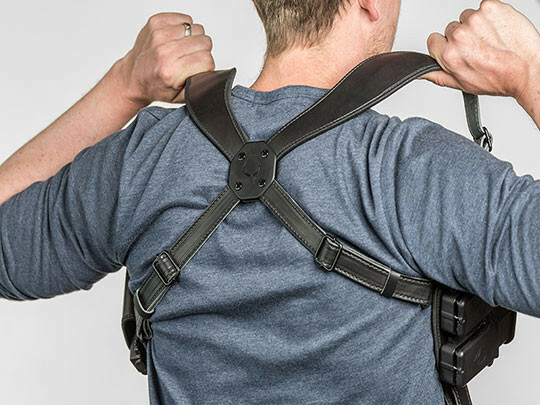 How should a shoulder holster fit? It should fit well, for a start...but let's build on that a bit more. The benefit of the ShapeShift Shoulder Holster, of course, is that you get the adjustability required to achieve the right fit. This was a design priority, and as a result, makes the ShapeShift Shoulder Holster unique compared to many one-size-fits...someone...designs from competitors. The holster must fit snug but not too tight. A loose-fitting shoulder rig won't carry comfortably and won't conceal well either. Tell-tale printing will occur through clothing, obviating the effort to conceal your pistol. You'll feel the gun bounce and swing around as you carry, which will make it awkward. The gun should right tight to the body. It shouldn't be so tight that it digs into you, but shouldn't jostle very much when walking. A little movement is to be expected; you're suspending a gun, which is heavy, by strapping. However, it should be rather minimal. If you're carrying your pistol in the horizontal position, you want the holster to ride in a location that doesn't hinder arm movement, but still allows for concealment. A good rule of thumb is to have the top of the slide in about the middle of the ribcage. That creates a bit of clearance and doesn't crowd the armpit. 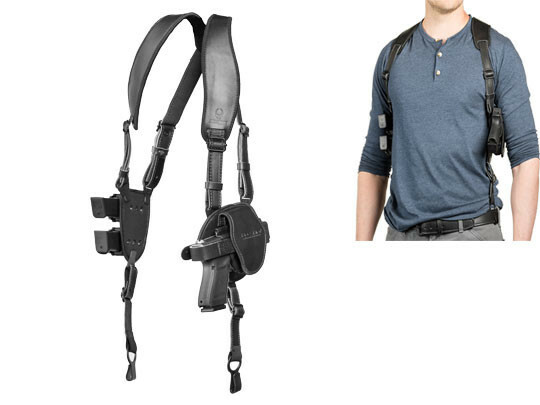 For vertical shoulder holster carry, you want the muzzle as close to the belt as possible. That prohibits the grip, rear of the slide (or worse, the hammer) riding up into the armpit. While you can remove the belt hooks on our shoulder holster, it's a good idea to employ them to pull the gun tight to the body. As you can see, some adjustment is likely to be needed for a proper fit with a shoulder holster, which is essential. If the holster and shoulder harness don't fit quite right, chances are you won't like carrying with it. What we at Alien Gear Holsters know through personal and professional experience is that a holster you don't like carrying with is one you're likely to not use. What, after all, is the point of having a concealed carry pistol if you aren't going to carry it?